View all products by North American Hemp Co.
Search no further: you've found the holy grail of body moisturizers. Your skin is soothed immediately with this fast absorbing lotion, improving moisture content for up to 24 hours. Skin is nourished with this formula's Certified Organic Hemp Seed Oil, nature's perfect solution to reinforce skin's natural defences against dryness. Within 2 weeks you'll notice a dramatic difference in skin tone and texture as Omega 3, 6, and 9 Essential Fatty Acids restore skin's radiance. Directions: Smooth onto dry skin daily. Ingredients: aqua, hemp seed oil, caprylic/capric triglyceride, glycerin, shea butter, emulsifying wax, stearic acid, cacao seed butter, cetrearyl alcoho, ceteareth-20, sunflower oil, sweet almond oil, acrylates/C10-30 alkyl acrylate crosspolymer, sodium hyaluronate, lime oil, grape seed extract, green tea extract, ginseng extract, chamomile extract, algae extract, bearberry extract, coneflower extract, licorice extract, sodium hydroxide, phenoxyethanol, caprylyl glycol. Love this skin lotion. It's easy to apply and absorbs fast. It's comforting to use a product that is healthy for the skin. I will continue to use this product. Well.ca ha many health conscious products. Love it! Amazing product! Moisturizing with no greasy feeling and it has a amazing natural scent that I absolutely love. My first time purchasing and i will continue to buy it's now my favorite body lotion. Love this lotion. My SO is sensitive to scents so I've been buying this for about a year now. It's super moisturizing. It absorbs well and doesn't leave any gross residue. This is the best body lotion I have ever used! I use both the scented & unscented, depending on the day & where I'm going. It actually hydrates my skin and doesn't just sit as a layer on top of it. I use it every day, but if I miss a day for some reason, my skin doesn't get dried out & flaky. It lasts for days on my dry hands. I really like it and normally I don't like hand creams because they are greasy or leave you wanting to wash your hands, not this one it just feels good and does a super job. Fast absorbing, not greassy, very moisturizing, wonderful lotion, very pleased! Super moisturizing, work really well in dry skin. fine to use on sensitive skin. Not the greatest smell but oh well. I love this lotion. I get unscented because I prefer it. I'm sure the scented is equally as good. Great for super sensitive skin! Love this lotion. Absorbs well and moisturizes. It has that unscented smell but it goes away quickly. This is my new favourite lotion. It absorbs well, moisturizes nicely and really is unscented. Nice light texture and very moisturizing. Love that it's unscented and don't find it smells much of anything at all. Also a Canadian product, which is a huge bonus! A nice lotion that absorbs well and isn't greasy. Smell is not my cup of tea but it is not offensive. Good lotion for the whole family! I don't really like the slight smell(similar to the unscented aveeno lotion) so because of that will probably try another lotion when finished this one. Or one of their scented lotions. But this lotion really did help the extremely dry skin my family was dealing with, very happy with the results! Very good lotion. Great ingredients, is actually really unscented and moisturizes very well. Great purchase. Highly recommend! I really like this lotion. I have it at work, and need it every time I come back from the washroom as the soap there dries out my skin. It's a great hand lotion with no scent. It's slightly greasy I'd say, but not so much that I dislike it. I just have to really work it into my hands before I can go back to typing. But you can tell it's really protecting your skin. Love love this product! I even use it on my face when I don't have a facial moisturizer on me. Will never go back. I find that this is a really good moisturizer overall. The packaging is quite fancy looking. Plus it's made in Canada using natural ingredients. Its moisturizing ability is 4 stars because it works great but I have to keep reapplying at least once to keep my very dry skin from feeling irritated. I used a Green Cricket lotion before this and that one wasn't good at all, so this lotion is actually a god send. It's also easily absorbed by my skin unlike Green Beaver's Boreal Body lotion which feels more like I applied sludge on my body because it takes so long before it gets absorbed. I love this lotion. It feels pure and natural and really delivers powerful moisture. This is by far and away THE best unscented, as 'close to natural' lotion I've ever had the pleasure of using. My # 1 favourite by far! A very lovely scent (a little like a nice bread), and quick to soak into skin. Would recommend and would buy again. GREAT body lotion for sensitive skin. Texture makes applying very easy, and it is thick enough that you actually feel your skin protected (which is a good feeling for sensitive/reactive skin). It takes 1-2 minutes to penetrate the skin, wich helps you see the missing spots. It is really unscented. I will buy again. Hands down this is the best lotion I have found. 2 of the skin issues I have had with itching and age spots have disappeared and I am cancelling my appointment with a dermatologist. I love this product and I've been using it for a few years now. It doesn't leave your hands greasy and it keeps your skin moisturized for a long period of time. It's great that it comes in an unscented version as well. 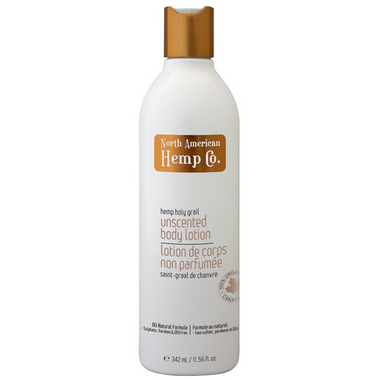 I purchased this product for my husband after his original hemp based lotion ran out. The price was great and the fact that it was unscented (and not fruity or floral) was a bonus. He is a bonafide paper-pusher and this is the only hand lotion that keeps the tips of his thumbs from cracking in the winter time. I like that its made in Canada and is not tested on animals. I did not like this lotion. I tend to have very dry skin in the winter and normally switch to a thicker lotion, which this one is. It left me with ingrown hairs everywhere! I tried it for about two weeks and have never used it again as a body lotion. I will continue to us it as a hand lotion, but it takes a while to sink in. I would not recomend this product to anyone. This is one of the best lotions i've used. I have dry sensitive skin and It helps my skin feel good. This is very creamy and luxurious, but after using it when I had shaved my legs, caused me to have many ingrown hairs. Not the greatest. Love it! Great for sensitive skin! I like that is was unscented and that it absorbs well but as for actually working well as a moisturizer; there are WAY better products out there. I have very dry skin, probably drier than most people's, and my skin would feel just as tight, itchy, and dry as is had before I put the lotion on it. I gave it two stars (instead of 1) because I like that it's made of natural ingredients.